Introduced in 1966, Jupiter (Malus domestica 'Jupiter') is the result of crossing the apple varieties Cox's Orange Pippin x Starking Delicious. 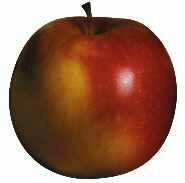 A large Cox-flavoured apple, but a more robust variety. Sweet, juicy, aromatic apples are produced with a particularly pale flesh. A strong growing tree performing well on all semi dwarf and dwarf rootstocks. Ideal for growing on the patio in a container.